WTF This looks good, but I do miss the old art style. 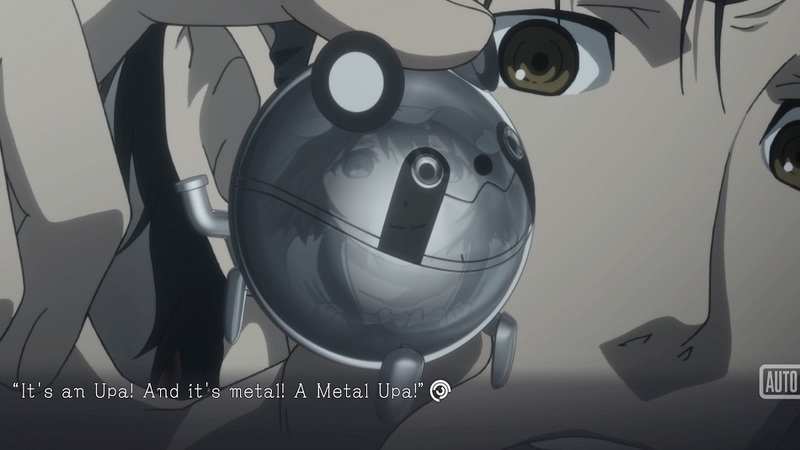 Scratch a fan of visual novels and Japanese-style adventure games, and there’s a good chance one will find a fan of 5pb’s seminal work, Steins;Gate. This unusually-punctuated adventure has been out and localized since the PS3 era, with releases on the PS Vita, PC, and even on mobile platforms in some regions. 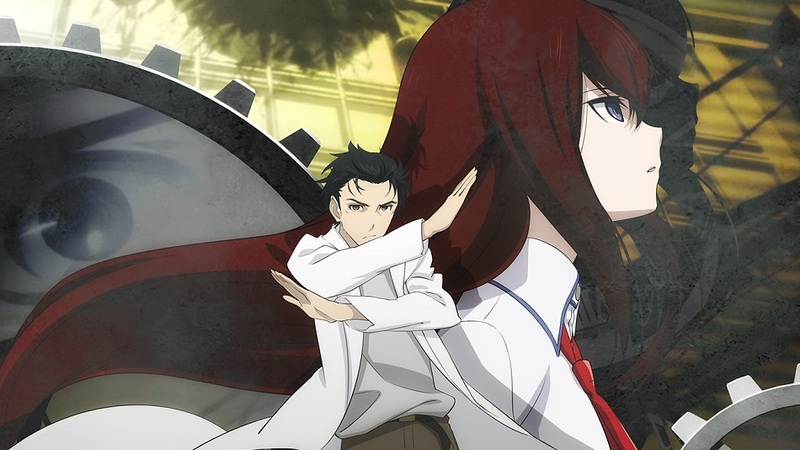 In 2010, a well-received anime adaptation by studio White Fox boosted Steins;Gate‘s appeal, even in the eyes of fans that ordinarily wouldn’t give a “dating sim”-like a second look. 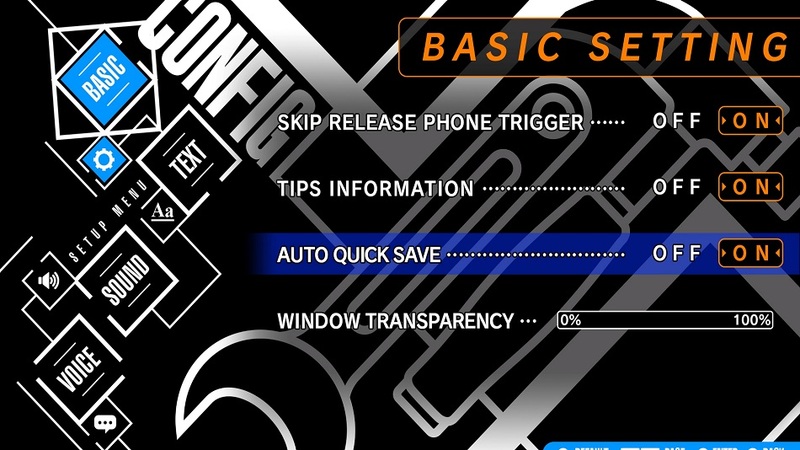 Now Spike Chunsoft has given the title a rebirth of sorts on current platforms, as Steins;Gate Elite. While the original presented as a classic Visual Novel with players reading dialogue underneath 2D cutouts illustrated by indie artist Huke, Elite is a radical retooling of the graphics, inspired by PS2-era FMV games like Sampaguita or the recently-localized 428: Shibuya Scramble. However, where Shibuya Scramble blended live-action video and static photography for its distinct look, Steins;Gate retains its anime-style aesthetic, replacing the original art with still frames and animated sequences pulled straight from the 2010 anime series. These sequences, along with some newly-created footage to fill in gaps, make a nearly ten-year-old game feel stunningly new. The use of cinematic angles and dramatic framing also does a much better job of driving home the impact of the text and voice work than the relatively plain original. Phrases like “It feels like you’re playing a movie” are infamous thanks to the wretched days of old-school FMV, but Steins;Gate Elite and its contemporaries are compelling best-case scenarios. 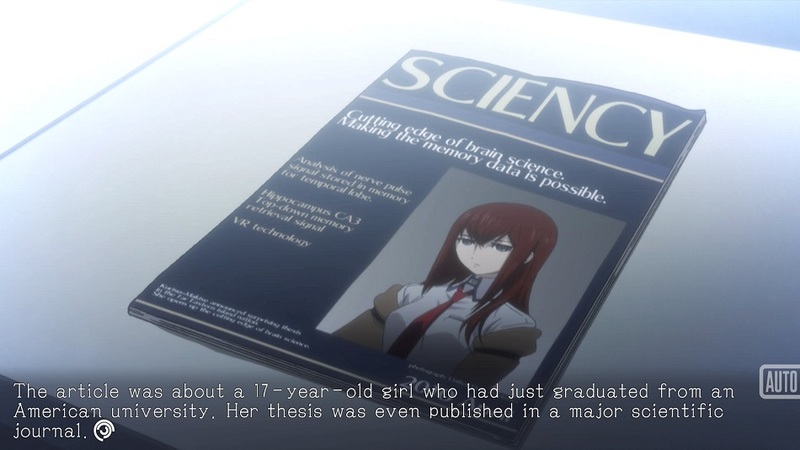 Not only does the potent presentation make this title noteworthy, it’s also far different from the many anime-flavored fantasy romps that make up the genre thanks to its narrative — Steins;Gate leans heavily on urban mystery, shot through with a conspiracy-theorist edge. Rintarou Okabe (don’t call him “Okarin”) could be a perfectly well-adjusted college student, but he prefers to while away his time cobbling together junky inventions in the Future Gadgets Laboratory — a glorified attic clubhouse where he and his friends, computer hacker “Daru” Hashida and cosplayer Mayuri “Mayushii” Shiina try their best to avoid becoming productive members of society. Stuck right in the middle of Tokyo’s famous Akihabara neighborhood, Steins;Gate is heavily steeped in otaku culture, featuring references to numerous real-life locations, otaku memes, and Japanese pop culture. This might be overwhelming if not for a handy and easily accessible glossary, unlocked progressively and available at the touch of a button. Less easily explained is the narrative’s paranoid streak, manifesting in Okarin’s affected persona as “the brilliant Mad Scientist Kyouma Hououin”, a renegade fighting the influence of a secretive world-spanning Organization from the shadows. Or so Okarin would have everyone believe. The protagonist’s seemingly-obvious delusions open the door to much bigger twists, as one of his gadgets (a cellphone-operated microwave) turns out to be a time machine capable of sending text messages into the past. Time travel, multiverse theory, and a host of staples from sci-fi drive the plot to some wild, dark places. Players have a measure of control over the narrative. At times they’ll be able to bring up Okarin’s phone to respond to texts by assembling pre-written fragments, mad-libs-style. These responses, as well as a few more carefully signposted turning points, steer the story to its various good and bad endings, and finding the “true ending” (always a necessary feature for the Visual Novel genre) will require multiple playthroughs (or at least reloads to key points). 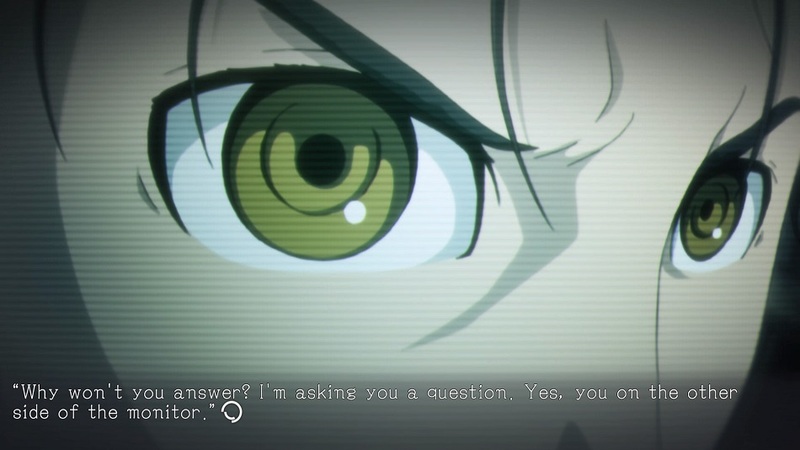 It’s all worth it, though, as Steins;Gate rightfully earns its reputation as a landmark adventure game. That said, aside from some small tweaks to better signpost a few easy-to-miss turning points and the aesthetic overhaul, Steins;Gate Elite is fundamentally the same game as it was many years ago. The writing and excellent localization is largely the same. Elite even uses the original voice acting rather than from the anime adaptation. However, this can lead to some lines feeling slightly flat and out-of-sync with the onscreen drama, since they were originally recorded for a less dynamic presentation style by voice actors at an earlier point in their careers. Finally, the shift in presentation may not be for everyone, especially since subsequent games like the sequel, Steins;Gate 0, and the Linear Bounded Phenogram anthology (included with download codes for Elite) use the older, more abstract art style. Barring an Elite-like retooling of those games, I can see the shift being jarring for some players. These are minor complaints, overall, though. Steins;Gate Elite is as good as Steins;Gate ever was, and its aesthetic retooling may give it just the pizzaz it needs to reach to a new generation of visual novel nerds. Disclosures: This game is developed by 5pb and Mages and published by Spike Chunsoft. It is currently available on PC, PS4, and Nintendo Switch. This copy of the game was obtained via publisher and reviewed on the PS4. Approximately 30 hours of play were devoted to the single-player mode. The game was completed. The side story Linear Bounded Phenogram, included with the review copy as a separate program, was tested. Parents: According to the ESRB, this game is rated Mature and contains descriptors for Blood, Sexual Themes, Strong Language, and Violence. Characters in the story use profanity and references to sexual violence are made, as well as bigoted language and jokes at the expense of minority characters. Some scenes, fully animated, depict violence and killing via knives and guns. Colorblind Modes: There are no colorblind modes. Remappable Controls: No, this game’s controls are not remappable. Growing up in the Philippines, Josh's video game habit and growing love for the medium were enabled by rampant piracy lowering the price of otherwise prohibitively expensive titles. He grew to treasure dense, RPGs he never had time to play and the anime antics of Japan's gaming industry,spending time with his friends in fetid internet cafes playing custom matches of Counterstrike. He would later discover and grow to love more persistent online games, and wrote his college thesis on the players of MMORPGs like World of Warcraft and Ragnarok Online. Today he continues to write for a living while trying to turn his fledgling knowledge of Japanese into a marketable skill. He is Managing Editor of Japanese culture site Japanator and is a Contributing Editor for Destructoid. He has written for The Escapist, The California Literary Review, Esquire Magazine, and proudly holds the badge as the premier apologist for Star Trek Online. Both Steins Gate and Steins Gate Zero are fantastic animes. Steins;Gate Elite is an impressive take on visual novels. Combining VN with anime cut scenes is a bold move, but judging from how it’s received, it seems like it has been executed perfectly. I honestly feel like this game is the future of visual novels for consoles.